It is a hobby that few people would find appealing and yet both my mother and I have been drawn into it. 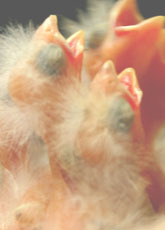 The hobby of hand raising baby finches is one of the most demanding around the clock endeavors you could ever undertake. My mother’s first save was a newborn Cordon Bleu. I brought it over to her house in desperation. It had been abandoned by it parents and also the zebra’s, who I had tried to foster it under. She had Societies sitting on eggs. We slipped 2 tiny hatchlings under her Societies. Immediately, they seemed to be taking to the babies. We thought, we had won. Two days later one was dead and the other was close to death. After one hand feeding, he seemed better and was placed under the societies again. After careful watching, we realized the societies were incubating, but not feeding the baby. Over the next ten days my mother continued removing the baby and feeding it several times a day. On several occasions, the baby was found near death. At day ten, it was permanently removed from the foster parents. The societies went to bed too early at night. The lack of feeding from 7 am to 7 pm left him dangerously weak each morning. Removing the baby and using a heating pad under a box worked great and he thrived. "Sprout" as he grew to be called, developed such a personality and bond with its now Mommy (my mother). Today, Sprout enjoys a tiny cage full of toys and mirrors. He has flight time out of the cage every day. Playing in my mother’s hair, cleaning under her nails and sleeping in her hand or pocket are part of his everyday playtime. His cage is next to a canary’s cage. They sing a mix of canary/ cordon bleu songs to each other. We have now saved 5 others. 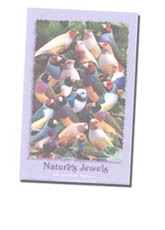 They were 2 Lavenders, 1 Gouldian, 1 Zebra 1 Society. For Christmas, I made my mother a hand painted, handmade glass aviary. I gave her the tame birds I had raised. Each day, she opens the glass doors and lets them out for bath time and play time with her. 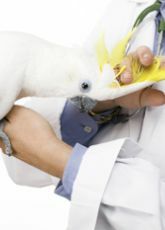 They are extremely tame and enjoy this playtime for about an hour before retreating back into the glass aviary for lunchtime. Sprout has never cared to join them, but rather prefers the one on one time he gets with his "Mommy". 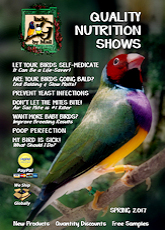 Many people have said hand raised finches will not mate and adapt to raising their young. The zebra is the only one we put in an aviary and stopped human interaction. This female has gone on to raise babies. 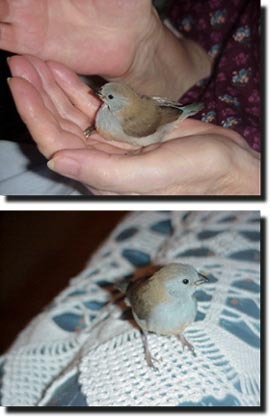 The Society finch, named Spot, has shown signs of wanting to foster. 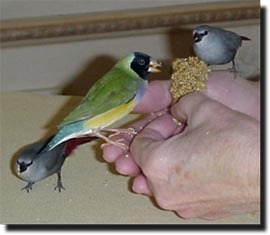 She actually fed "Cry Baby", the baby Gouldian. During the weaning process, "Cry Baby" definitely lived up to her name. The Society, Spot, who was only one week older than "Cry Baby", actually fed her. Spot is now sitting on fostered eggs. They were Cordon Bleu eggs and unfortunately turned out to be infertile. We see every sign that she will raise babies and allow my mother to help in the process.